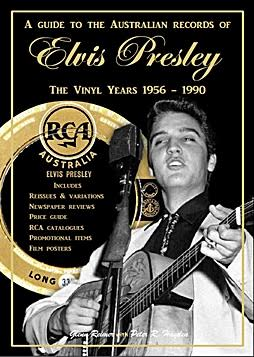 New Australian book release - A Guide to the Australian Records of Elvis Presley The Vinyl Years 1956 – 1990. Just released is Glenn Reimer’s collaborative effort with noted Elvis historian, Peter R. (Bob) Hayden: A Guide to the Australian Records of Elvis Presley The Vinyl Years 1956 – 1990. The release weighs in at over 1 kilogram and contains 250 pages, making it the most exhaustive examination of Elvis’ record history in Australia. The result of many years of research, it included the author spending countless hours scouring through library records and Elvis collections in order to source the most authoritative information possible.